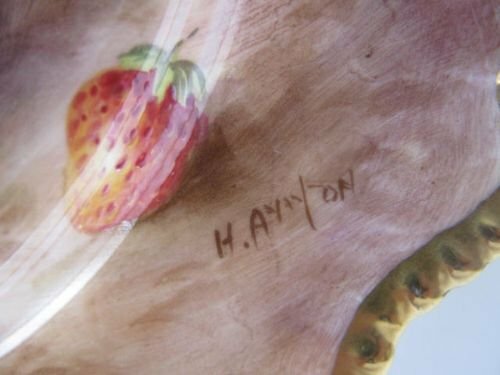 A Royal Worcester Fruit Painted "Bow" Vase by H. Ayrton. 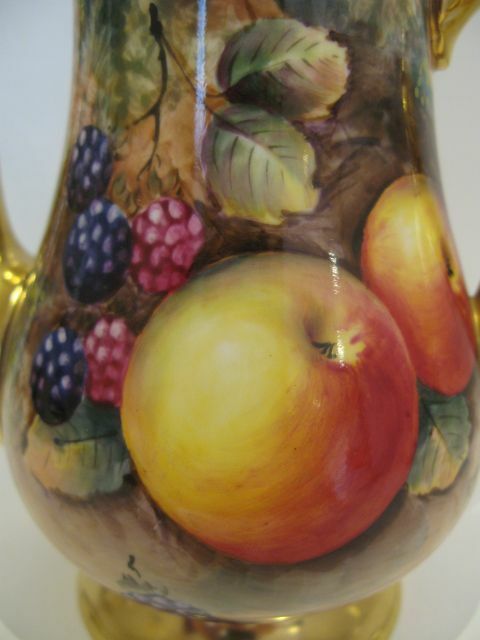 A fine Royal Worcester porcelain "Bow" vase, shape number 1428, with very well painted fruit decoration by Harry Ayrton. 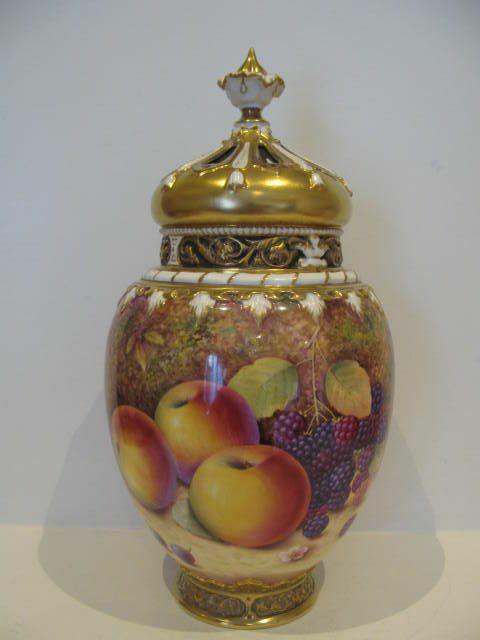 Standing approximately 12.1/2"tall x 10"maximum width, it has the black factory stamp for circa 1965-70 and is in excellent condition with no damage, crazing or restoration, and apart from slight signs of wear where the lid sits, the gilding is also excellent. 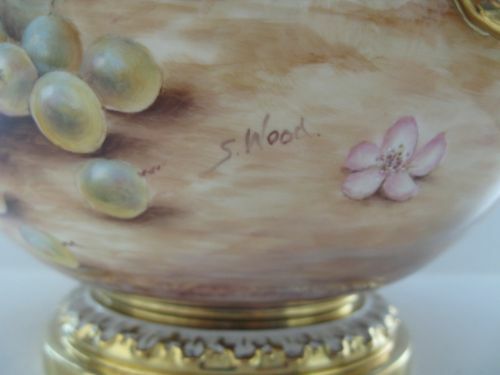 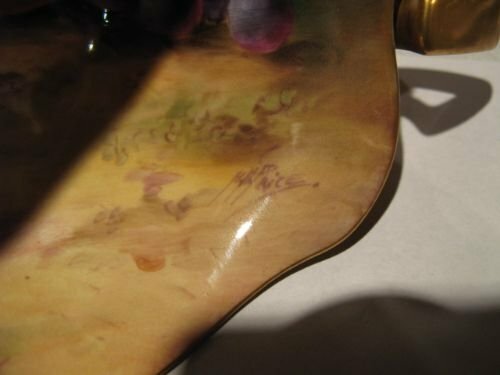 A Royal Worcester Fruit Painted "Bow" Vase By S. Wood. 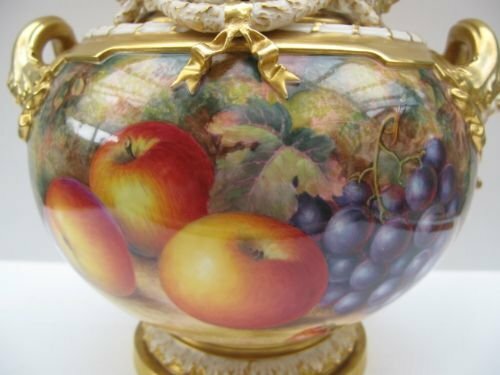 A fine quality Royal Worcester porcelain, medium size "Bow" vase, shape number 1428, with well painted all around fruit decoration by Sally Wood. 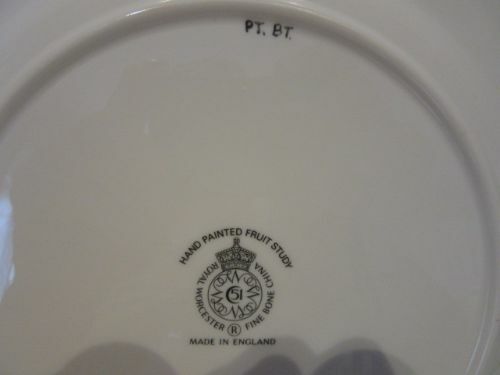 With the black factory stamp and dating from the last quarter of the 20th century, it stands a very impressive 14.1/2"overall height x 13"diameter and is in fine condition with no damage, crazing or restoration and the gilding is bright and without wear. 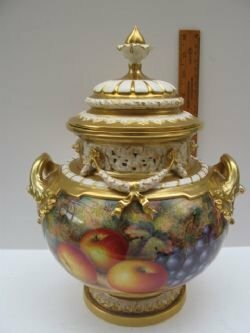 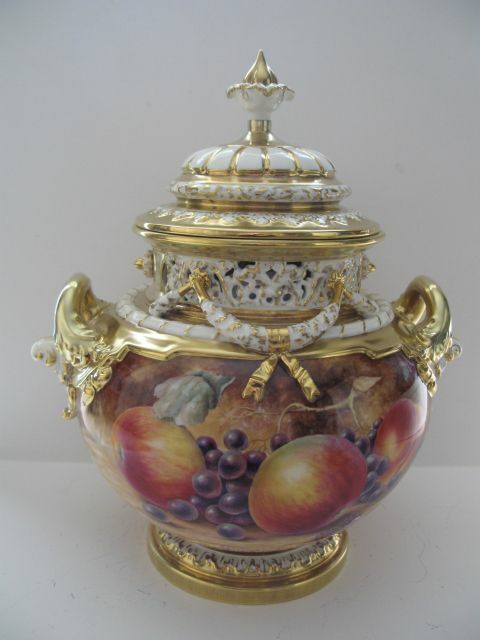 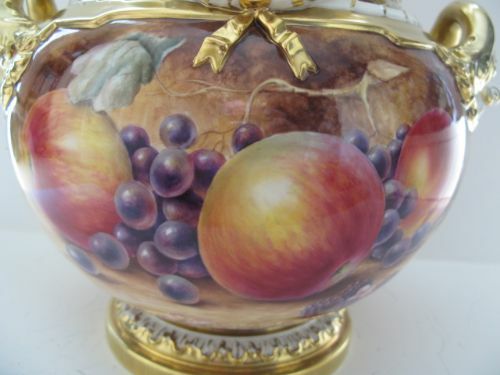 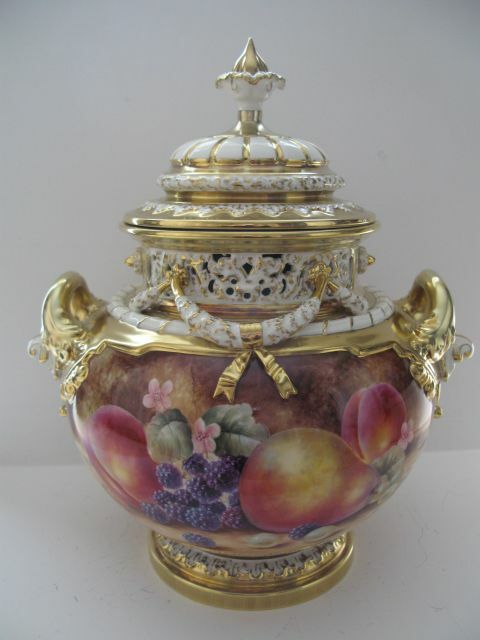 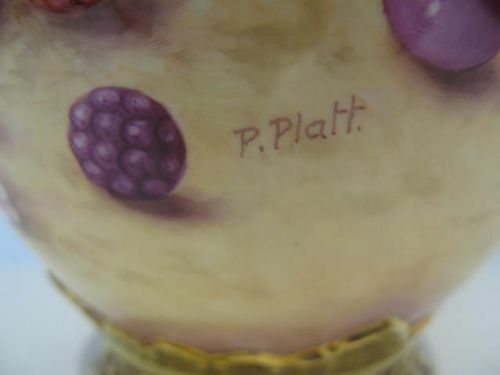 A Royal Worcester Fruit Painted "Crown Top" Pot Pourri By P Platt. 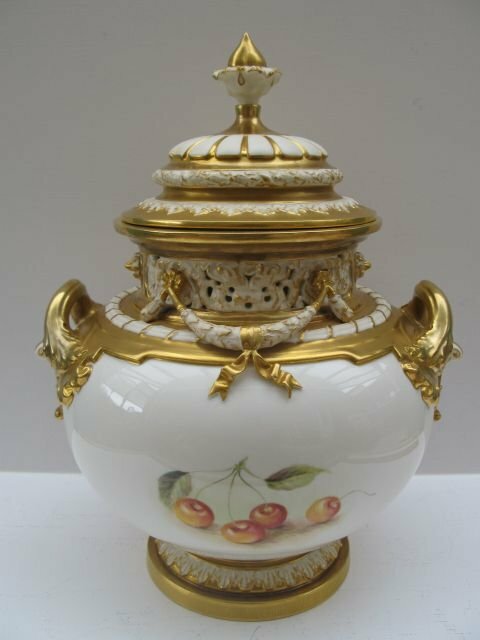 A very impressive Royal Worcester "Crown Top" porcelain pot pourri, shape number 2048 medium size, complete with both inner and outer lids and with well painted all-around fruit decoration by Peter Platt. 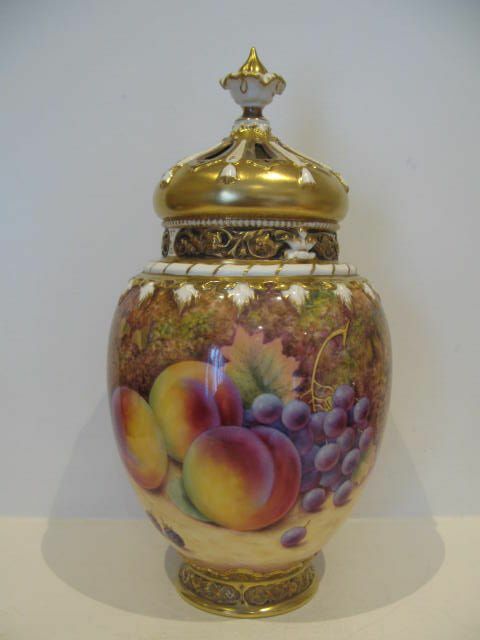 Standing approximately 13.1/4"overall height x 7"diameter, it has the black factory stamp for circa 1990 and is in excellent condition with no damage, crazing or restoration, and the gilding is bright and without wear. 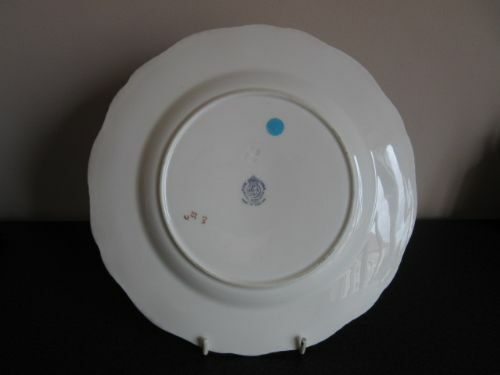 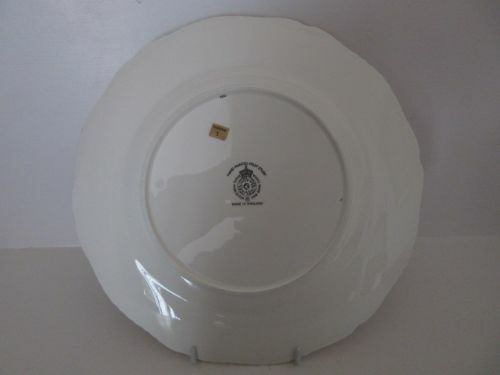 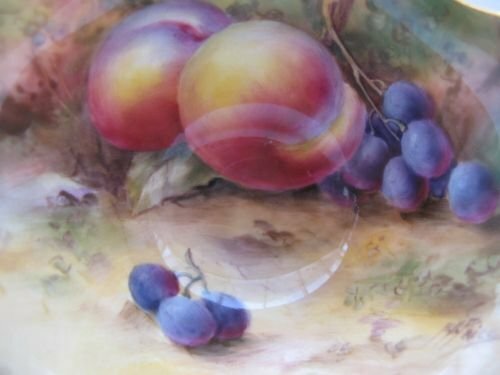 A Royal Worcester Fruit Painted 10.5/8" Plate By P. Stanley. A good, Royal Worcester porcelain dinner plate, with heavily gilded gadrooned rim and decorated with well painted apples, brambles and black grapes against a mossy background by Paul Stanley. 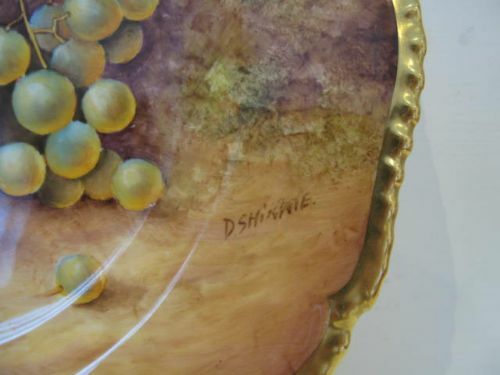 Measuring approximately 10.5/8"diameter x 1"deep, it has the black factory stamp for circa 1980 and is in excellent condition with no damage, crazing or restoration and the gilding is bright and virtually without wear. 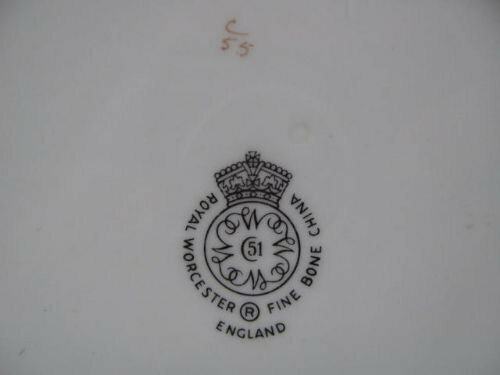 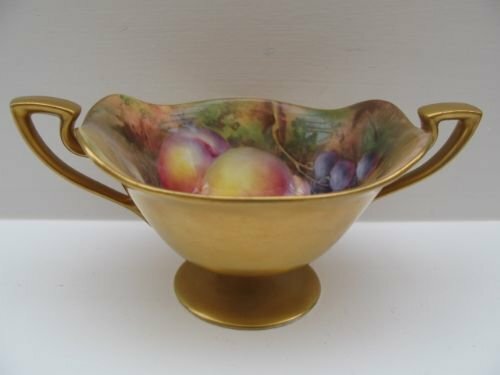 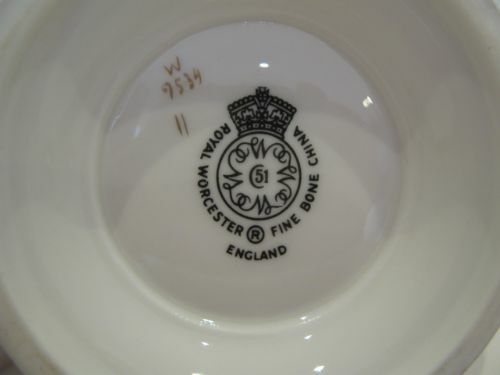 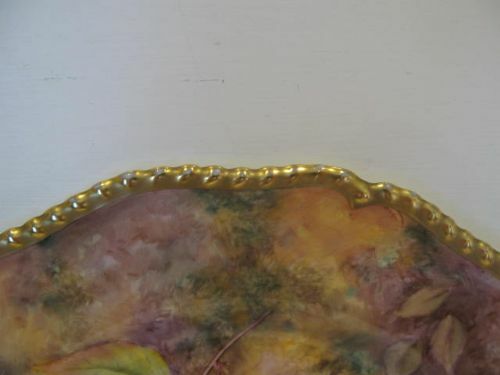 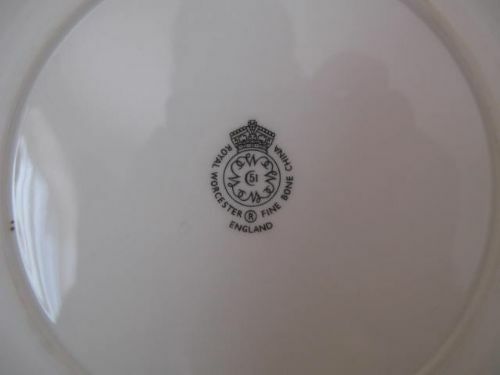 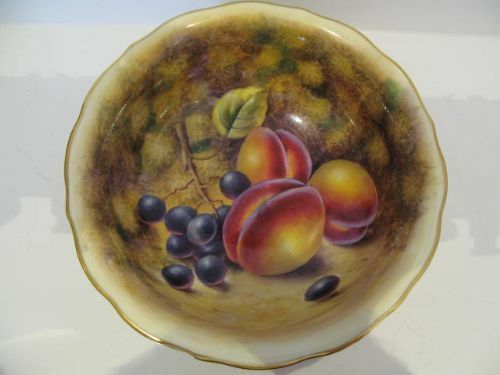 A Royal Worcester Fruit Painted BonBon Dish By Price. 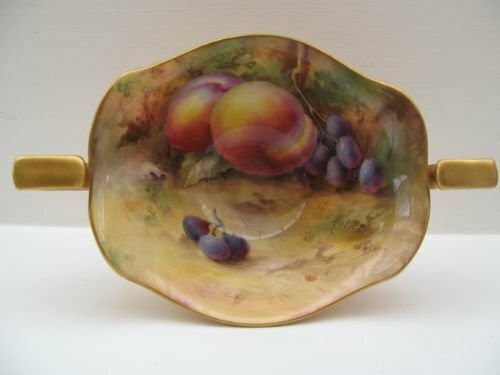 A Royal Worcester porcelain, two-handled bonbon dish with well painted fruit decoration by Horace Price. 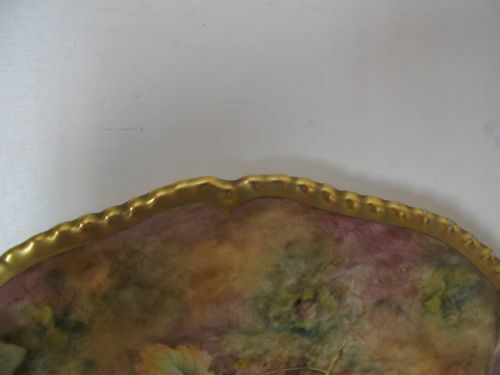 Standing approximately 5.7/8"long over the handles x 3.3/4"wide x 2.1/2"high, it has the puce factory stamp for 1922 and is in good condition with no damage or restoration, and the gilding is unworn, with only one or two slight scuffs. 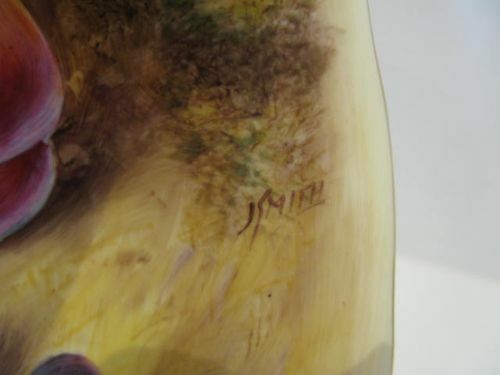 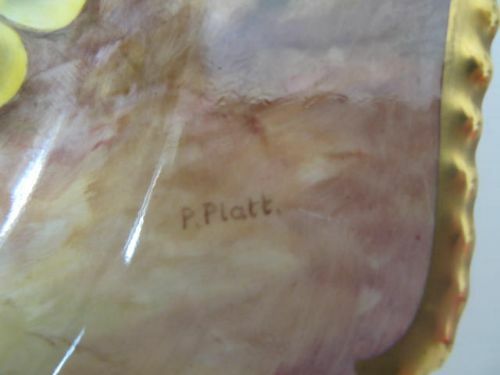 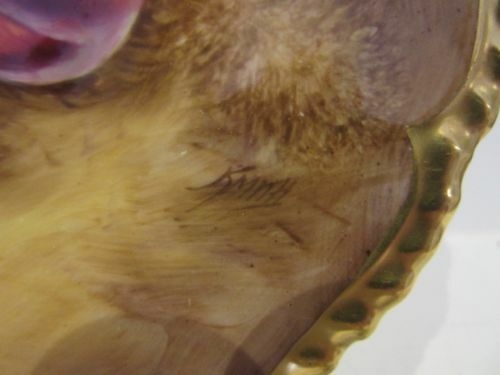 There is some glaze crazing underneath the footrim as can be seen in picture four. 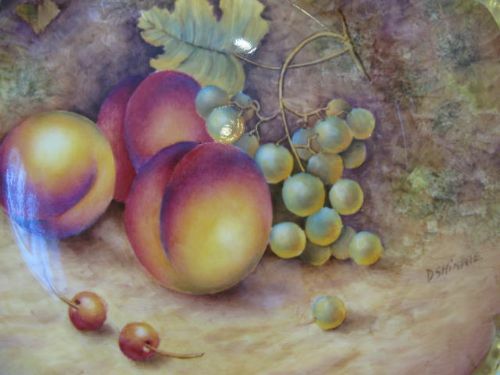 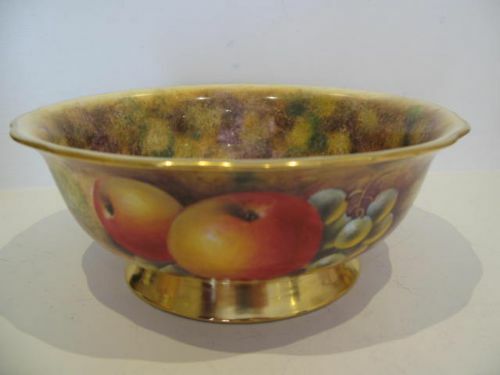 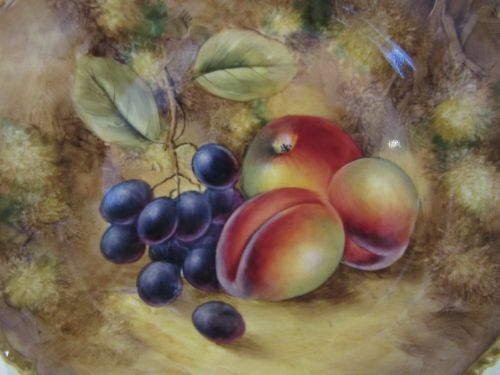 A Royal Worcester Fruit Painted Bowl By J Smith. 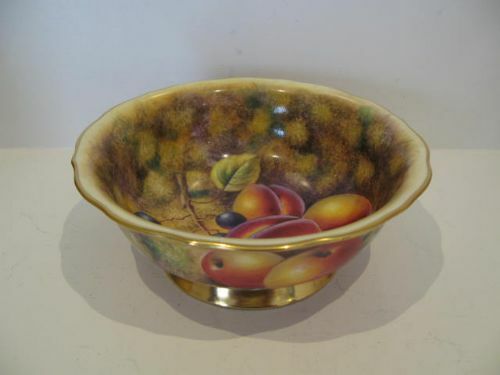 An attractive Royal Worcester porcelain bowl, with well painted all-around fruit decoration, both inside and out by John Smith. 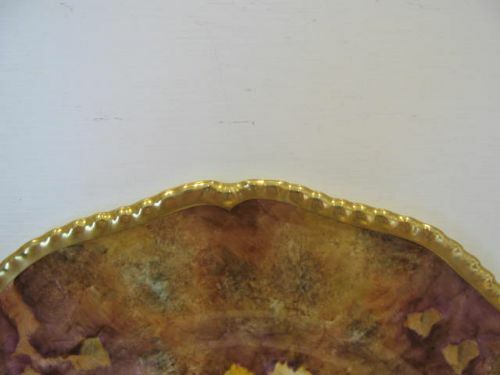 Standing approximately 9.1/4"diameter x 3.1/2"deep, it has the black factory stamp for circa 1970 and is in excellent condition with no damage, crazing or restoration, and the gilding is bright and without wear. 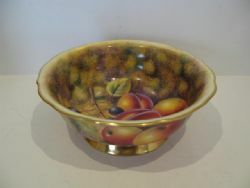 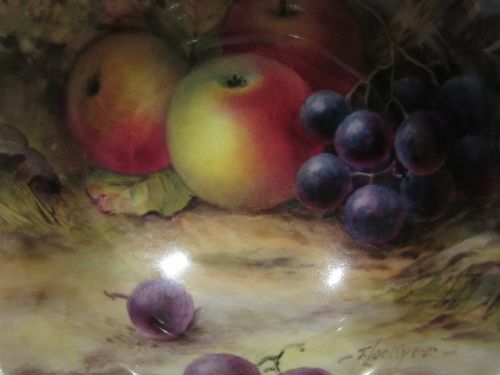 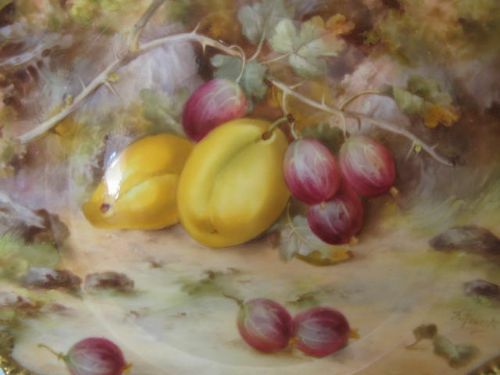 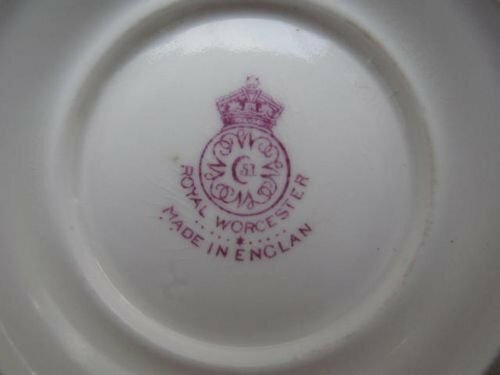 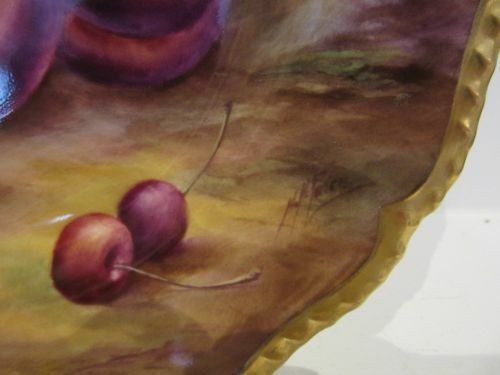 A Royal Worcester Fruit Painted Bowl By T. Lockyer. An attractive Royal Worcester porcelain bowl, the exterior decorated in mottled blue and the interior with superbly painted apples and black grapes against a mossy background by Thomas Lockyer. 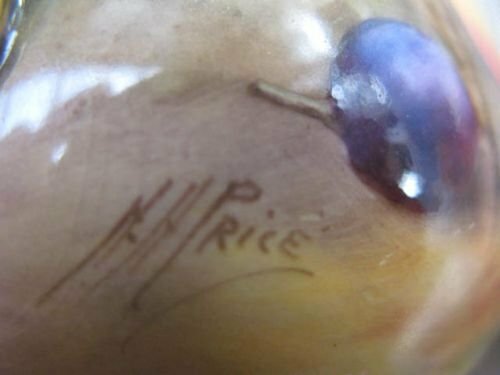 Measuring approximately 5.1/4"diameter x 2"deep, it has the puce factory stamp for 1921 and is in very good condition with no damage, crazing or restoration and the gilding is bright and shows only the slightest signs of wear. 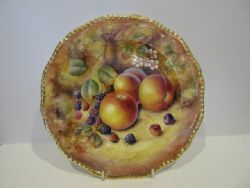 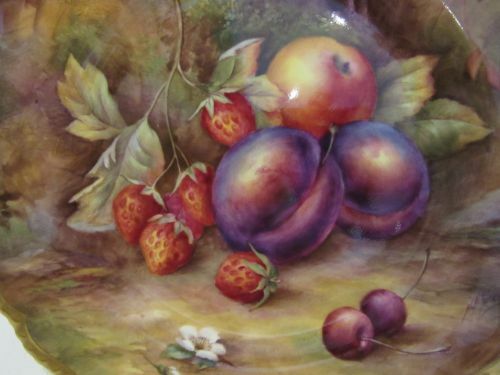 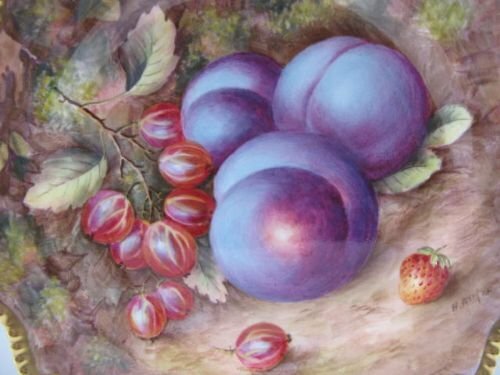 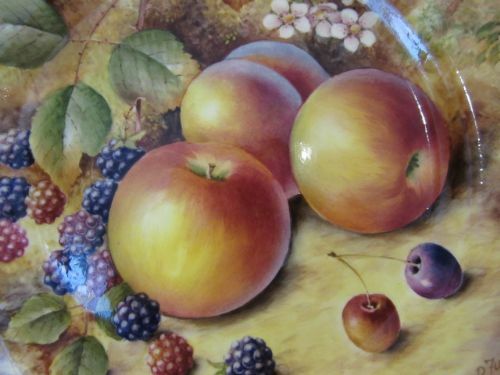 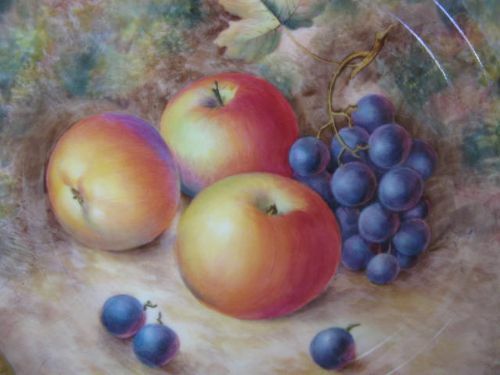 A Royal Worcester Fruit Painted Cabinet Plate By D Shinnie. 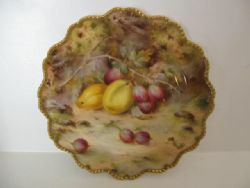 A Royal Worcester porcelain cabinet plate, with heavily gilded shaped rim, and fruit painted decoration by D. Shinnie. 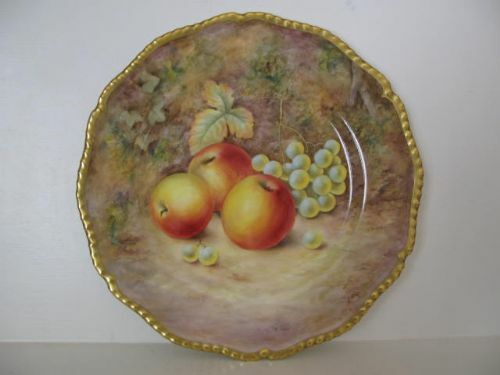 Measuring approximately 10.5/8"diameter, it has the black factory stamp for circa 1980 and is in excellent condition with no damage, crazing or restoration, and the gilding is bright and without wear. 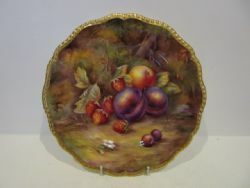 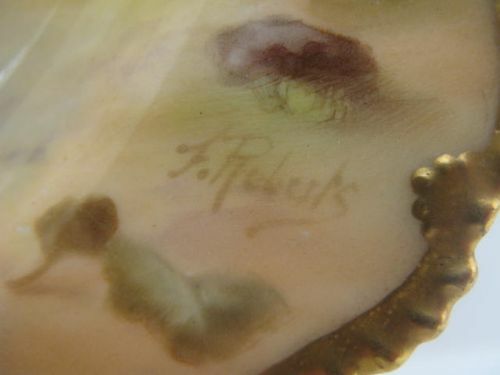 A Royal Worcester Fruit Painted Cabinet Plate By F Roberts. An attractive, Royal Worcester porcelain "star" plate with very well fruit painted decoration by Frank Roberts. 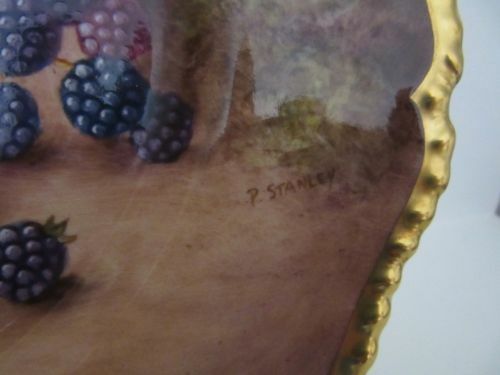 Measuring approximately 8.3/4"diameter x 1"deep, it has the puce factory stamp for 1919 and is in very good condition with no damage, crazing or restoration and the gilding is without wear. 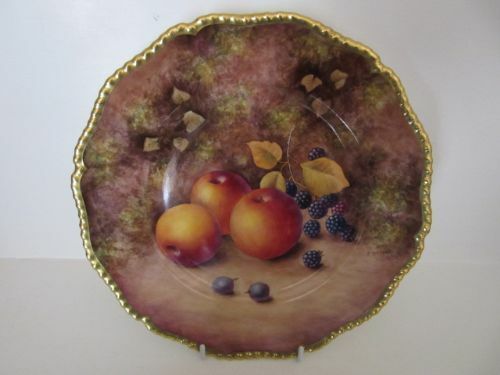 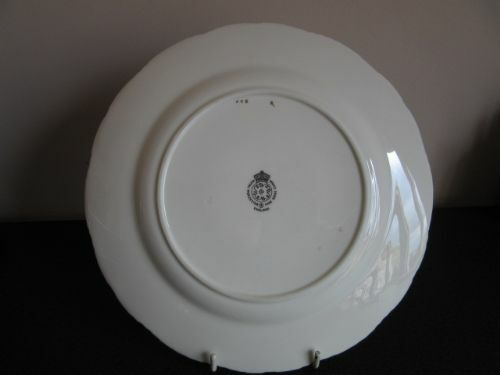 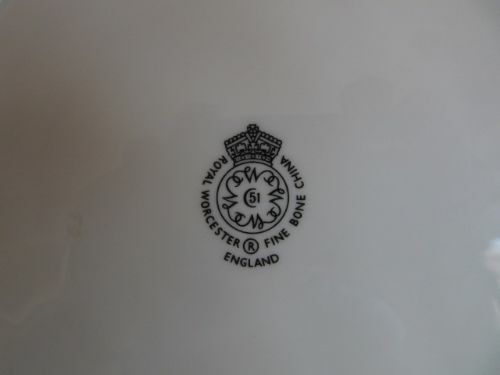 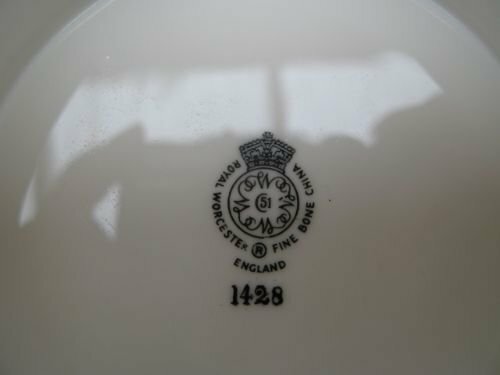 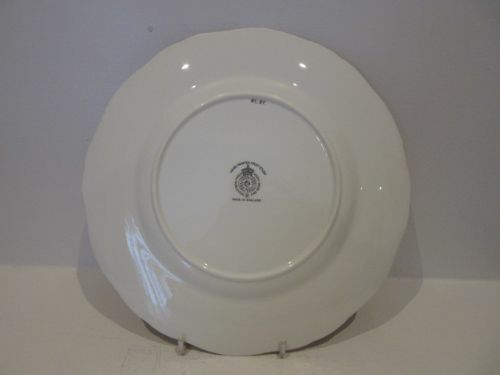 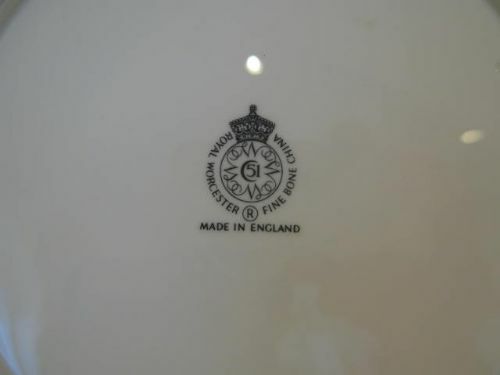 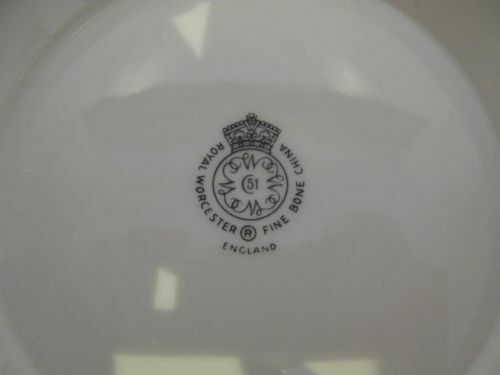 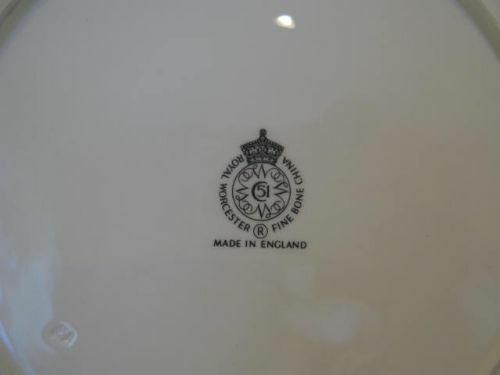 A Royal Worcester Fruit Painted Cabinet Plate By Freeman. 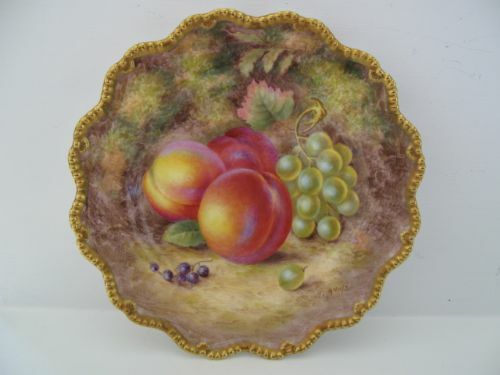 A Royal Worcester porcelain cabinet plate, with heavily gilded shaped rim, and fruit painted decoration by John Freeman. 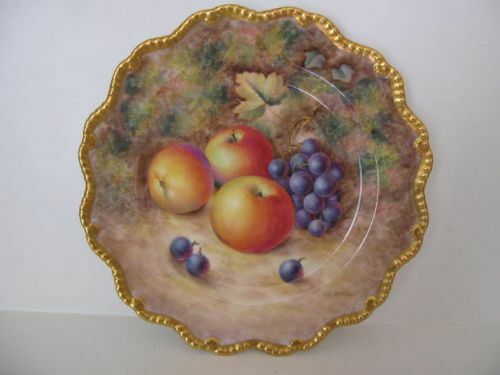 Measuring approximately 10.5/8"diameter, it has the black factory stamp for 1975 and is in excellent condition with no damage, crazing or restoration, and the gilding is bright and without wear. 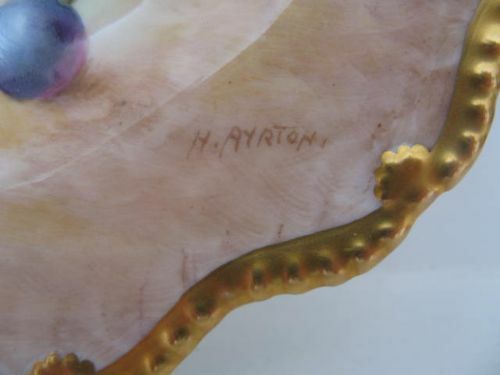 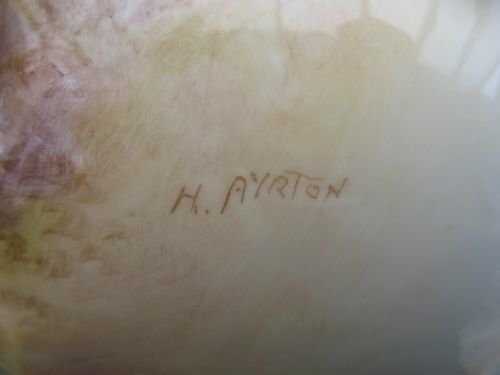 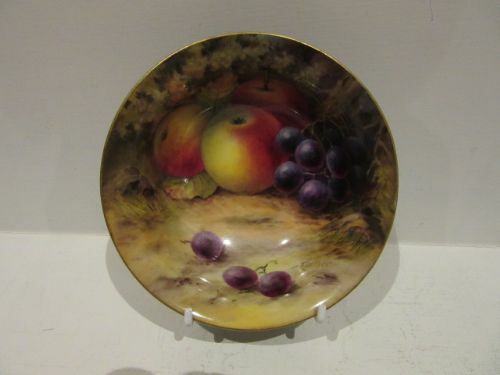 A Royal Worcester Fruit Painted Cabinet Plate By H. Ayrton. An attractive Royal Worcester porcelain cabinet plate with heavily gilded and gadrooned "star" rim and well painted fruit decoration by Harry Ayrton. 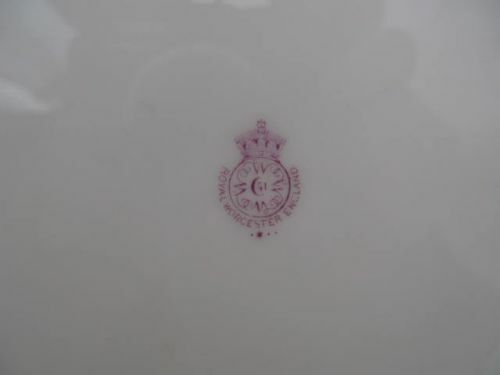 Standing approximately 8.3/4"diameter x 1"deep, it has the black factory stamp for circa 1965 and is in excellent condition with no damage, crazing or restoration, and the gilding is bright and without wear. 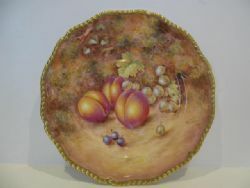 A good, Royal Worcester porcelain cabinet "Star" plate, with heavily gilded gadrooned edge and well painted fruit decoration by Harry Ayrton. 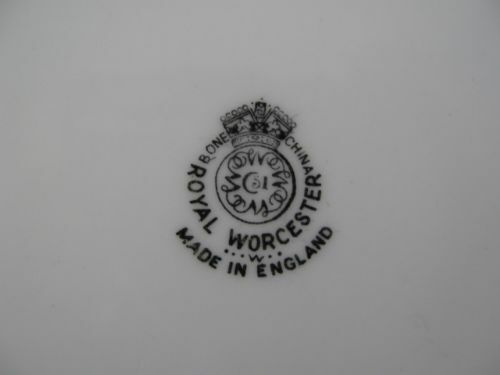 Measuring approximately 8.3/4"diameter, it has the black factory stamp for 1955 and is in excellent condition with no damage, crazing or restoration, and the gilding is bright and without wear. 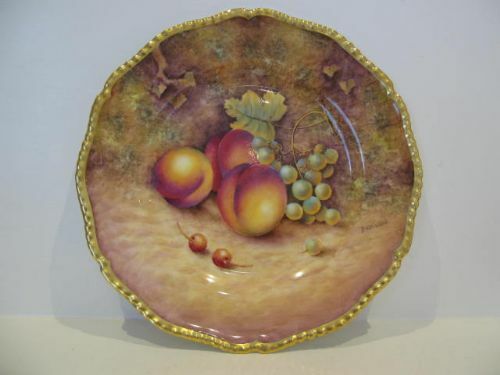 A good, Royal Worcester porcelain cabinet plate with heavily gilded, shaped and gadrooned border, and well painted fruit decoration by Harry Ayrton. 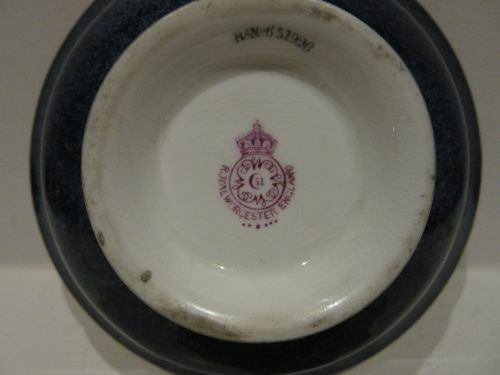 Measuring approximately 8.3/4"diameter and with black factory stamp for circa 1965/70, it is in excellent condition with no damage, crazing or restoration, and the gilding is fresh and unworn. 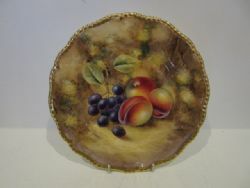 A Royal Worcester Fruit Painted Cabinet Plate By H. Price. An attractive, Royal Worcester porcelain cabinet plate with shaped and heavily gilded rope-twist edge, and decorated with well painted plums, apples, strawberries and cherries against a mossy background by Horace Price. 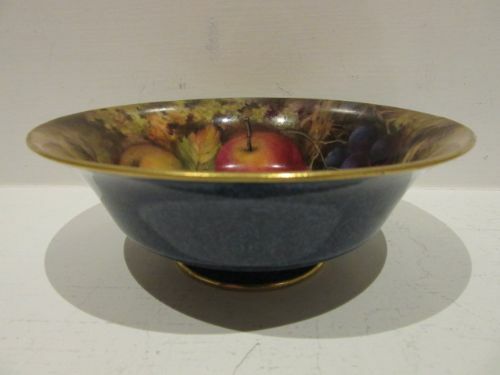 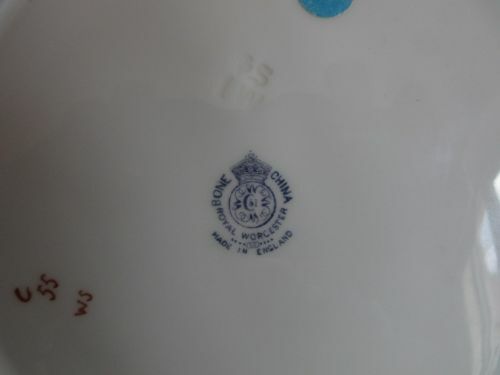 Measuring approximately 9.3/8"diameter, it has the blue factory stamp for 1940 and is in excellent condition with no damage, crazing or restoration and the gilding is bright and virtually without wear. 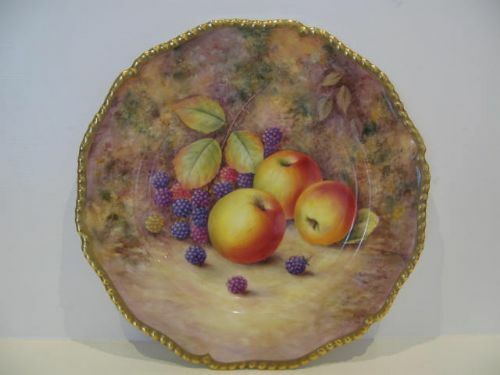 A Royal Worcester Fruit Painted Cabinet Plate By J. Smith. 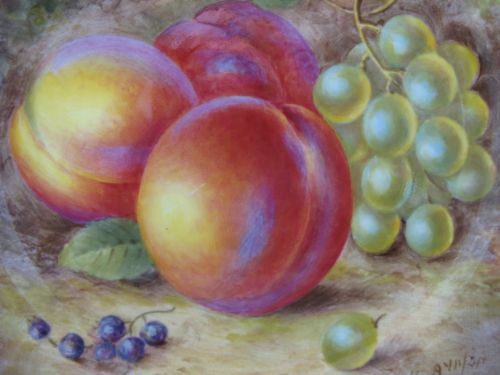 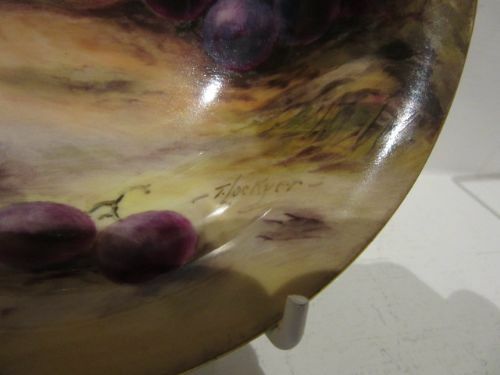 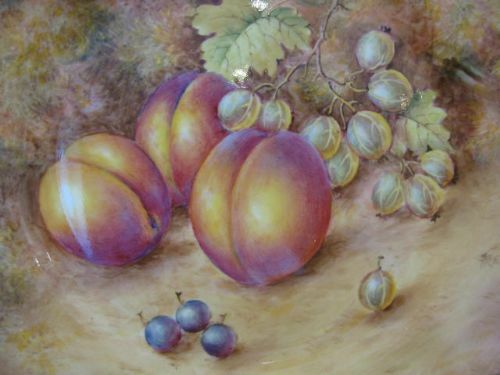 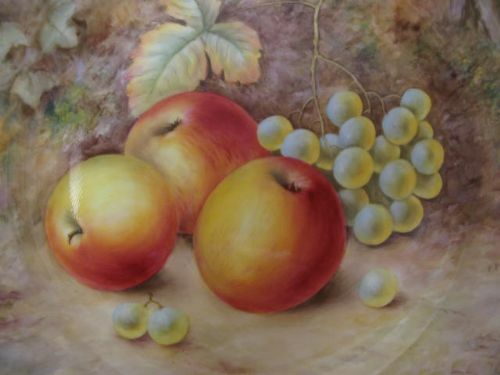 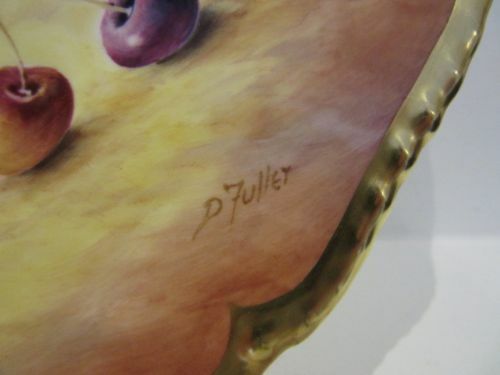 A Royal Worcester porcelain cabinet plate, with shaped and heavily gilded rim, and decorated with painted plums, apples and black grapes against a mossy background by John Smith. 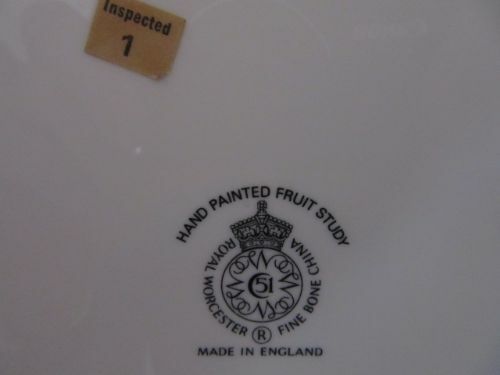 Measuring approximately 9.1/2"diameter, it has the black factory stamp for circa 1965/1970 and is in excellent condition with no damage, crazing or restoration and the gilding is bright with virtually no wear. 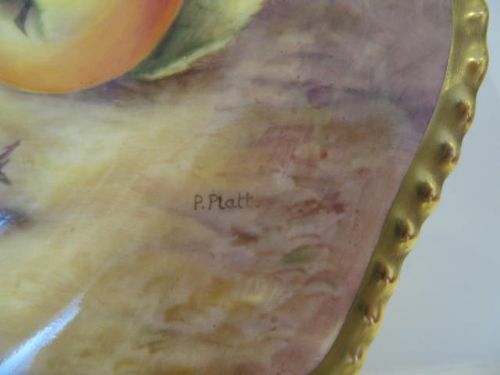 A Royal Worcester Fruit Painted Cabinet Plate By P Platt. 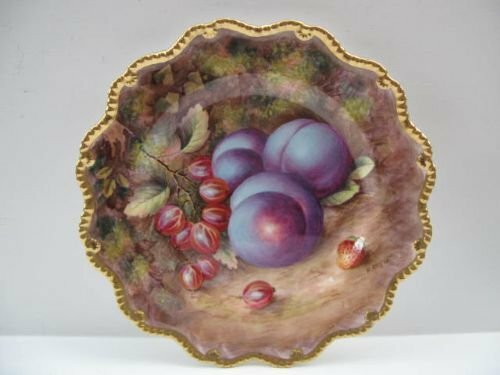 A Royal Worcester fruit painted cabinet plate, with heavily gilded and shaped rope-twist rim, and fruit painted decoration by Peter Platt. 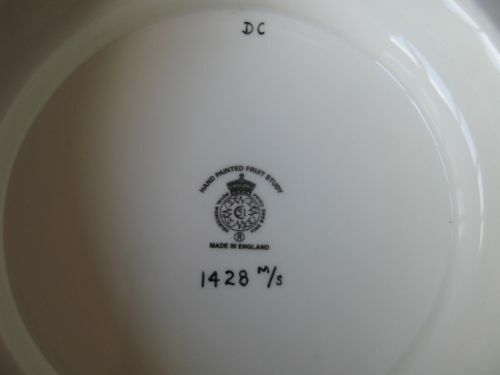 Measuring approximately 10.5/8"diameter, it has the black factory stamp for circa 1975 and is in very good condition with no damage, crazing or restoration, and the gilding shows only the very slightest signs of wear. 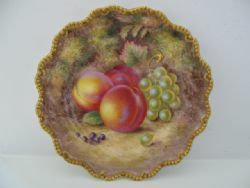 A Royal Worcester porcelain cabinet plate with heavily gilded shaped rim, and fruit painted decoration by Peter Platt. 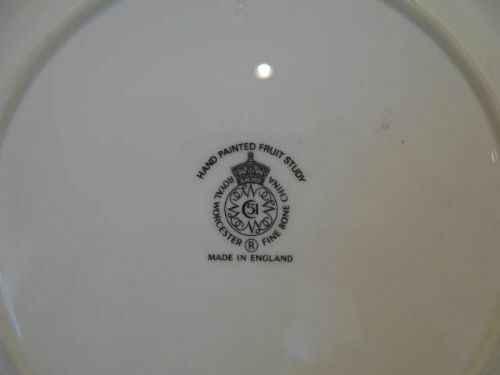 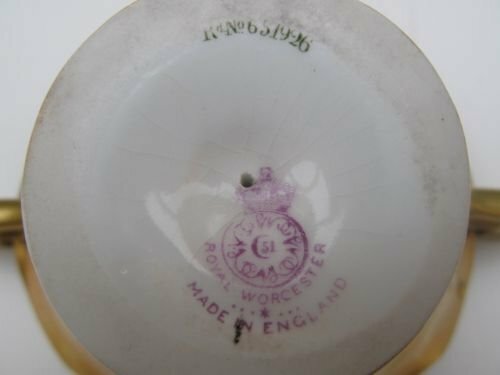 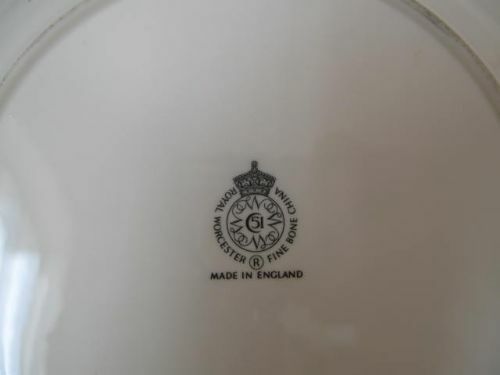 Measuring approximately 10.5/8"diameter, it has the black factory stamp for circa 1975 and is in very good condition with no damage, crazing or restoration and the gilding shows only slight signs of wear. 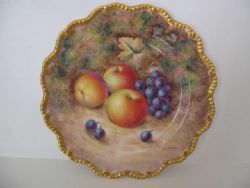 A Royal Worcester Fruit Painted Cabinet/Dinner Plate. 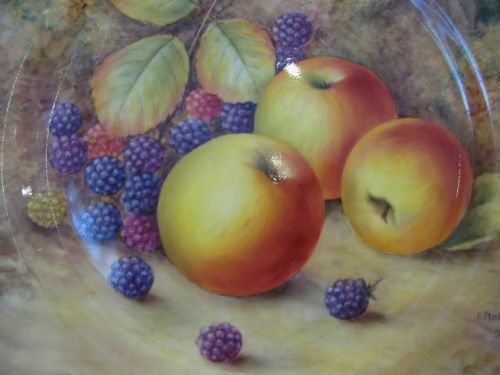 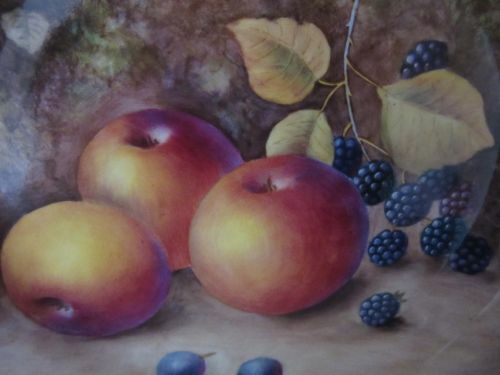 A good Royal Worcester porcelain cabinet/dinner plate, with well painted apples, brambles and cherries against a mossy background by David Fuller. 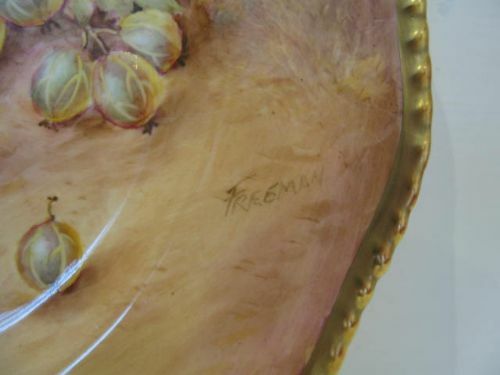 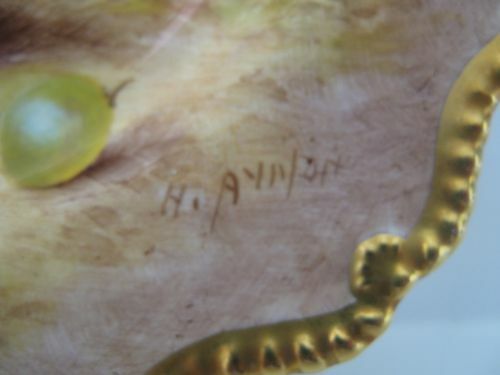 Measuring 10.5/8"diameter x 7/8"deep, it has the black factory stamp for the last quarter of the 20th century and is in excellent condition with no damage, crazing, scratches or restoration and the gilding is bright and shows virtually no wear. 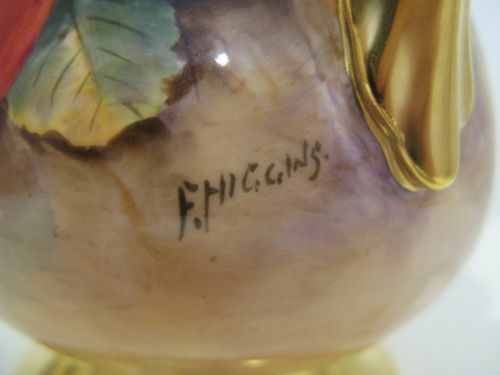 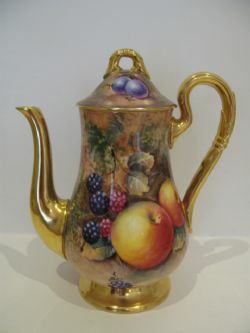 A Royal Worcester Fruit Painted Coffee Pot By F. Higgins. 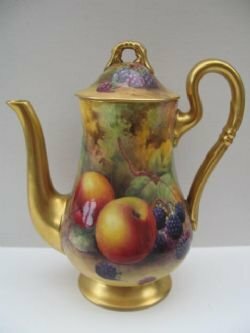 A good Royal Worcester porcelain full sized coffee pot and lid, with well painted all around fruit decoration by Frank Higgins. Standing approximately 8.1/4"tall x 6.3/4"wide from the handle to the tip of the spout, it has the black factory stamp for circa 1970 and is in immaculate condition with no damage, crazing or restoration and the gilding is fresh and without any wear. 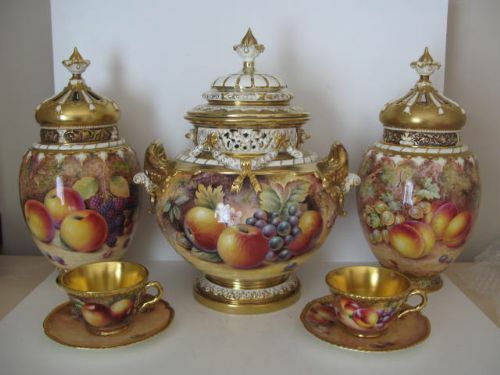 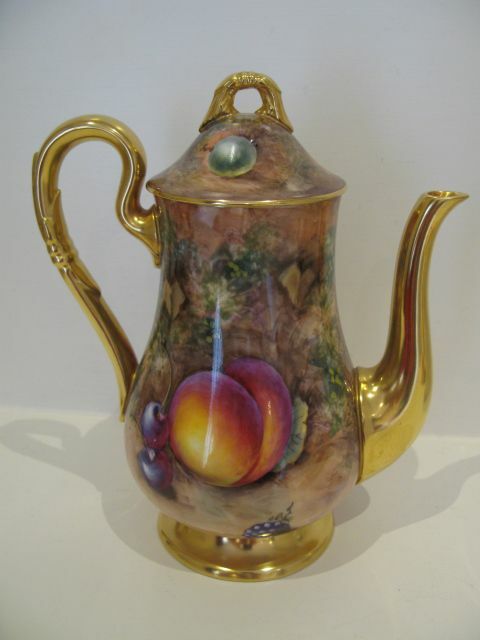 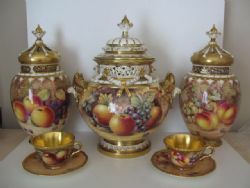 A Royal Worcester Fruit Painted Coffee Pot By Horace Price. 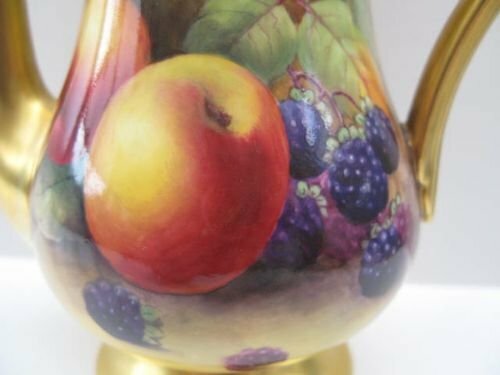 A good, Royal Worcester porcelain coffee pot with well painted fruit decoration by Horace Price. 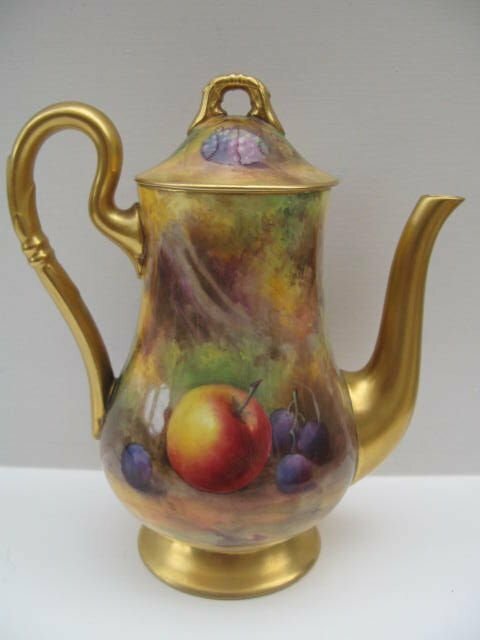 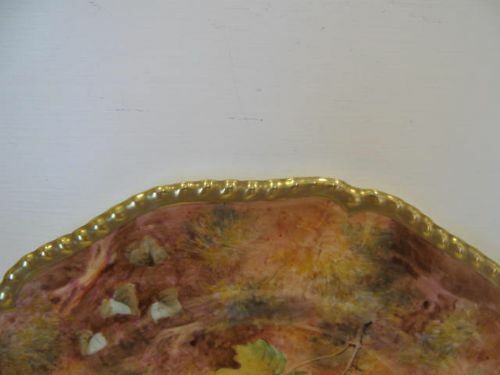 Standing approximately 7"overall height x 6"wide from spout to handle, it has the puce factory stamp for 1926 and is in excellent condition with no damage, crazing or repair, and the gilding is fresh and unworn.